Tonight on American Idol it was the girl’s turn as the Top 12 Girls tried to wow the judges and America for votes and a shot at the final Top 10 voted in by the viewers or even one of the three Wildcard spots chosen by judges Steven Tyler, Randy Jackson, and Jennifer Lopez. Ryan also reminds us that a girl hasn’t won the competition in the last five seasons. Kicking things off is Chelsea Sorrell, who takes a stab at Carrie Underwood’s “Cowboy Casanova” and it’s a good thing she’s a pretty girl because she did nothing for this song. She had no power, no command of the song or audience, and was a total snoozer of a way to start the night. Randy says doing a Carrie song wasn’t the best move for her because she’s done that before already, and it didn’t show her strengths. JLo said she was nasally and Steven said she needs to work on her timing. Rhode Island’s Erika Van Pelt is showing her balls early by taking on Heart’s “What About Love” and it starts off well with the lower notes. Then she loses her way some before getting to the chorus which is more lackluster than I expected, and she shouted at us for the rest of the song. Steven said her confidence is magical, JLo said she’s one of the power voices and if that’s true, we’re in trouble. High school cheerleader Brielle Von Hugel decides Otis Redding’s “Sitting On The Dock Of The Bay” is the best way to introduce herself to America, and if her goal was to showcase wobbly, pitchy vocals she definitely made the best choice. She had some good moments with a pretty tone in there but overall it was just a mess, however it was the best mess of the evening so far. Steven said she’s got a real understanding of the blues while JLo and Randy loved the whole thing, even comparing her to Janis Joplin. Small town country songbird Skylar Laine decides she wants to rock out tonight and chooses to do so with “Stay With Me” by Faces. Apparently “rocking out” and “making mean faces while I shout” are the same thing in Skylar’s world. This was awful. Randy calls her Reba for the 800th time and threw in a Kelly Clarkson comparison for good measure. Steven called her a pistol and told her to keep it up. Yet another country girl is up, this time it’s Baylie Brown doing Lonestar’s “Amaze,” which is a difficult song to sing and Baylie makes it seem like it’s the hardest thing on earth with her immediate pitch problems. It never really gets any better and even the judges pull the “you’re so pretty” card just to have something nice to say to her. Hollie Cavanagh is yet another recycled Idol castoff from seasons past which is making me think more that it’s a sign of the bottom of the barrel of available girl’s talent this year rather than they’ve come back stronger and much improved. Hollie takes a beautiful, simple song like Christina Aguilera’s “Reflection” and makes it look so damn hard. I can’t even understand half the words she’s singing, that said, she hits a couple big notes and she’s probably the best of the night. Steven loved it and made a creepy comment about letting her hair down, JLo predicted she’s a front-runner and Randy said she’s been one of their favorites all season long so far. When we first met Shannon Magrane, Creepy Uncle Steven memorably told her dad she was “Hot, humid and happenin’” which is exactly the opposite of how I’d describe her performance of “Go Light Your World.” Her voice is pretty and strong but it was kind of worthless this evening on this particular song. Randy said she was “mad young and calm” and she gave JLo her first “goosies” of the night. 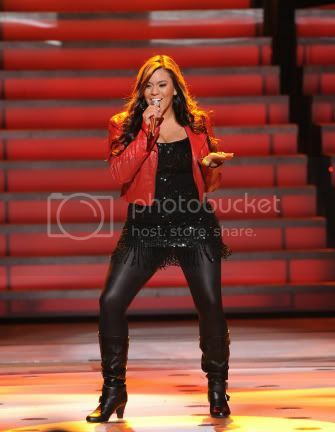 Jessica Sanchez has swollen vocal chords a la Lauren Alaina last year. At least little Lauren didn't blow her voice until later in the season. Giving us the first jazzy, fun to listen to song of the night with "Love You, I Do" I had high hopes for this girl but, this particular song but it was shouty and overdone. She did sing her heart out though, I’ll give her that. Eben Franckewitz stood up and shouted "so good!" once she was done. Randy declared that performance the best of the last two nights. It’s sad when the girl with the messed up voice is the best of the night. In the pimp spot of the evening is Elise Testone who starts off at the piano showing Jen Hirsch how it’s done on our second taste of "One And Only" of the night. It was rocky and had some weird, spoken word moments, but in between the screeching and squawking it really was okay. I love the sultry rasp of her voice. The judges predictably go nuts for her and finally, we’re free from this mess. The only thing left to do is sit back and wait to see who America puts through and who the judges deem worthy of three wildcard spots. The best of the girls tonight were: Elise Testone, Jessica Sanchez, and Brielle Von Hugel. This was hard to do because Shannon and Hallie were my favorites coming in to tonight. The worst was: everybody else, and this time I’m not kidding. I predict the five safe Guys for Thursday’s results show will be: Colton Dixon, Heejun Han, Phillip Phillps, Joshua Ledet, and Reed Grimm. Top five Girls: Shannon Magrane, Jessica Sanchez, Hollie Cavanagh, Jen Hirsch, and Elise Testone. My guess for the three Wildcards are: Deandre Brackensick, Aaron Marcellus, and Hallie Day. What did you think of tonight’s outing by the Girls? Who are your picks to win it all?